In my earlier post in this series, I talked about the ‘Beti Bachao Beti Padhao’ scheme of the government aimed at protecting and educating the girl child. This post talks about Ujjwala Yojana which is focused on making the lives of women better and easier by providing them access to clean fuel. According to a recent report by UN, the indoor pollution in India contributes up to 52% air pollution. The indoor pollution is caused due to the burning of traditional solid fuels like wood, charcoal, animal dung and crop waste for cooking. According to another report published by India State-Level Disease Burden Initiative, India that has 18% of the global population, has a disproportionately high 26% of the global premature deaths and disease burden due to air pollution. In 2017, there were 12.4 lakh people that died due to air pollution. Out of these, 4.8 lakh deaths were due to the indoor air pollution. There are myriad health problems caused by the household air pollution including pneumonia, stroke and lung cancer. 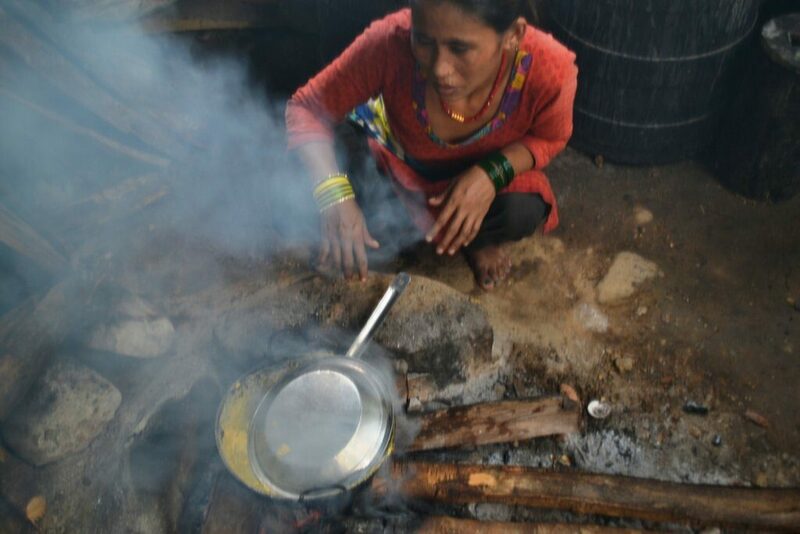 It is needless to say that the indoor air pollution impacts the women, the most. For these families, it becomes a vicious circle as the loss of productivity and the money spent to cure the problems caused by unclean fuel pushes them further into poverty. After coming to power, Modi government drew an ambitious plan to provide 5 crore BPL (below poverty line) families subsidized LPG connection as clean fuel (support of Rs 1600 per connection). The plan was called Pradhan Mantri Ujjwala Yojana. It was aimed at safeguarding the health of women and children by eliminating indoor air pollution that they had to face due to use of unclean fuel. The scheme targeted a period of 3 years to provide LPG connections to all 50 million families. The scheme demanded substantial amount of funds for implementation. But the Ministry of Petroleum and Natural Gas (MoPNG) had already prepared the ground to fund Ujjwala Yojana through philanthropic contribution by willing citizens and the CSR funds of the public sector oil companies operating in India. In March 2015, the government of India launched a campaign called ‘Give it Up’. As part of the ‘Give it Up’ campaign, PM Modi appealed to the well to do families to surrender their LPG subsidy so that a BPL family can be helped to gain access to clean LPG fuel. As people started responding to the appeal, the MoPNG took an innovative approach to recognize the contribution of people through a ‘Scroll of Honour’ page. The page had a list showing the name of the consumers who surrendered the subsidy and alongside the names of the beneficiary BPL consumers were listed. This ensued confidence and a feeling of satisfaction in the consumers ‘giving it up’. India is full of people who want to help others. However, many a times, a feeling that their contribution may get swindled away through corrupt means is what prevents them from acting. The ‘Scroll of Honour’ helped create the confidence in people for ‘giving it up’. By end of April 2016, more than 1 crore consumers had given up their claim on LPG subsidy, forever. This created a steady source of fund to implement the Ujjwala Yojana. Ujjwala Yojana was launched on 1st May 2016 from Ballia in Uttar Pradesh. The scheme focused on the rural families and the connections were issued in the name of the women of the households. The government also launched ‘Pradhan Mantri LPG Panchayat’ initiative in September, 2017. The LPG Panchayat is meant to provide an awareness platform for the new LPG consumers. LPG Panchayat helps the consumers to connect and interact with each other. The platform promotes mutual learning through interaction and experiences shared by other consumers. With a fast pace implementation, the government achieved the target of 5 crore families on 3rd August 2018, in just ~28 months after it was launched. Looking at the fast and efficient implementation by the MoPNG and success of the scheme, the government revised the target to provide LPG connections to 8 crore households and the benefits were extended to all left out poor families. As of today, 7.19 crore Ujjwala LPG connections have been issued. The states of Uttar Pradesh, West Bengal, Bihar, Madhya Pradesh, Rajasthan, Odisha and Maharashtra account for more than 68% of the total number of Ujjwala connections issued. In last ~5 years, around 13 crore LPG connections have been issued which is more than the total number of connections issued till 2014. 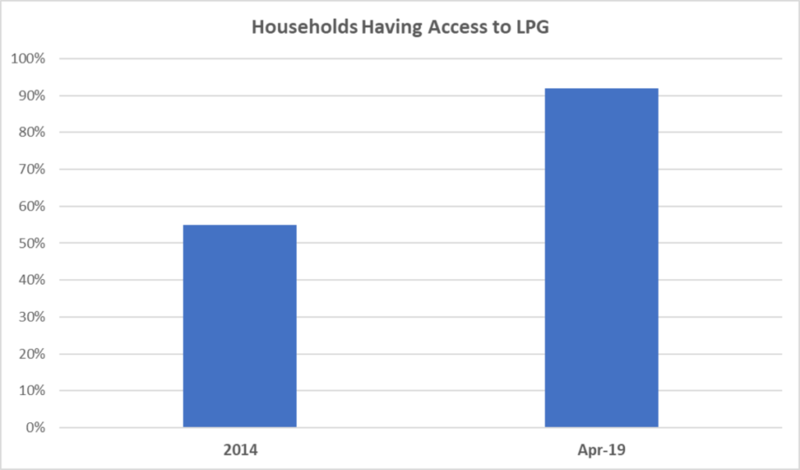 This planned focus on clean fuel has raised the total number of households in India having access to LPG from 55% in 2014 to now more than 90% now. Ujjwala Yojana has certainly reduced the indoor air pollution that women and children had to face due to burning of unclean fuel. This has helped in reduced respiratory and other kind of problems in those families. Ujjwala has also eliminated the wastage of time that women had to spend for collecting the solid fuel. Now this time can be used by the women in other productive activities. Collecting the wood and other solid fuels in forest comes with a health and safety risk that has been eliminated by LPG through Ujjwala. While the clear measures showing reduction in overall air pollution are yet to come, it doesn’t need special data to conclude that Ujjwala scheme has helped in reducing the household air pollution (as is explained in this article). It needs a diverse set of activities (which are going on) to control the overall air pollution. Ujjwala is one of the very important step in that direction. As all the households get access to LPG and use it consistently, it will positively impact the overall air pollution scenario in India and help improve the life expectancy of people.